These exquisite products are created with 100% first cold-pressed extra virgin olive oil, seasoned with prized black or white truffles. The truffle imparts an unmistakable aroma and taste that transforms pasta or risotto dishes into an unforgettable meal. Extra virgin olive oil flavoured with Black Truffles - Tuber melanosporum Vitt. 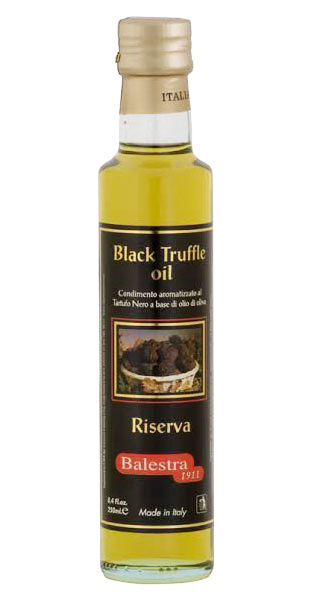 Black Truffle Olive Oil is highly concentrated and can be diluted with additional extra virgin olive oil. Bottle size: 8.08 oz/250 g, contains 70 servings.